Super Bowl commercials are incredibly underpriced – even at a $5 million+ price tag, they should cost way more than they do in 2019. If you told me that you have $25 million and you wanted to sell some stuff, I would look at Super Bowl commercials first — then I would look at Facebook, Instagram, and YouTube ads. This is why I talk a lot about being in the attention business over the social media business. The only reason I’m interested in social media is that it has captured the attention of so many. The Super Bowl is one of the single biggest events in America. 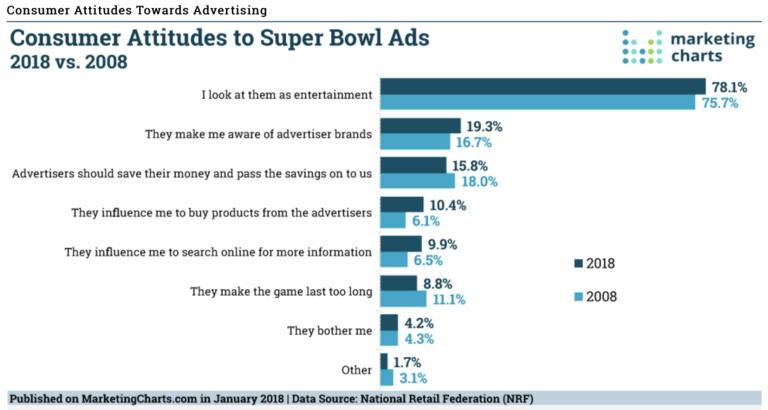 Virtually everyone is watching – and the attitudes towards Super Bowl ads haven’t really changed for over a decade. I felt it back in 2014, when I didn’t watch the Super Bowl. I just laid in bed. It felt surreal – it was mind-blowing knowing that all of America was doing one thing, and my brother AJ and I were just sitting in silence. For me, that really drilled home the fact that this is such a massive event in America with so much attention around it. From a marketing standpoint, there’s a “brand” that’s been built around Super Bowl commercials. The reason I’m so bullish on them because the commercials actually get consumed. During the event, there are always a ton of people watching them, and even after the event people love to look up Super Bowl commercials on YouTube and vote on the best ones. When it comes to regular TV, the “event” is to consume the actual TV show and reach for your phone during the commercial breaks. The event is not to consume the commercial — but during the Super Bowl, the commercials are a big part of the fun. And that’s why I think the ROI is there — even if it’s $4 million or $5 million for a short spot. I think it’s worth $10 million or more. I spoke to Jennifer Saenz (CMO at Frito-Lay) and Greg Lyons (CMO at PepsiCo) about how they’re thinking about Super Bowl commercials as marketing leaders at major brands. When we first started talking about commercials and how we thought about them, Greg took the conversation in a fascinating direction. For PepsiCo, what has also been a great opportunity (in addition to running commercials) is sponsoring the Super Bowl halftime show. Given the context of the show and the brand of Pepsi, they’ve been able to use the halftime show to help cement themselves into pop culture. Every year that Pepsi sponsored the halftime show, they were the most talked about brand on Twitter. I also asked Jen and Greg about the actual business impact of Super Bowl commercials as well and how she thinks about that at Frito-Lay. I always enjoy talking about ads that drive sales. 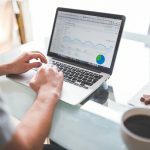 I’m a salesman at heart and driving business results is a super important part of this whole equation. For a brand like PepsiCo, it’s a clear positive ROI investment. People consume Pepsi products while they watch the game. People shop for their products before the game. Unlike an insurance company or a car company, there’s a stronger level of practicality for a brand like Pepsi to invest in these commercials. The thing about Super Bowl Commercials in 2019 is that companies are able to release a portion in advance. Instead of just releasing a commercial and having it consumed during the game, they’re able to release teasers for the commercial leading up to it. And that helps. A lot. Because companies are putting out teasers of the commercials ahead of the Super Bowl, it makes even more sense. That means that they’re able to influence the purchase decision before the game when consumers are in Walmart or Safeway shopping for snacks. It can also be incredibly exciting for employees at those companies to see their company’s ad on TV. Over the past several years, companies have taken a slightly different strategy when it comes to creating commercials for the Super Bowl. This was the start of brands trying to focus on continuing the conversation around their advertisement. 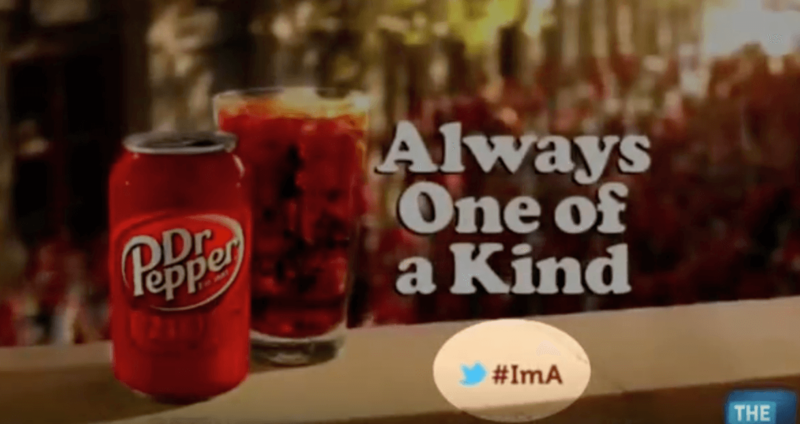 The best commercials create some sort of action that viewers can take after they finish watching the commercial — whether that’s tweeting a hashtag to be part of a conversation, liking a Facebook page, or something else. For example, one really good way to do this is by playing a part of the commercial on TV, and forcing people to consume the rest of it on a social media platform. Ultimately, it comes down to storytelling and understanding what types of content will create buzz and get people talking. It becomes even more important to tap into those currents of conversation. As long as you’re interested in stories and creating content around what your audience would love, you’ll be able to crack an amazing creative idea. Companies like Pepsi can afford to use celebrities to “cut through” into relevancy, but small businesses and startups can use influencers. At the end of the day, it’s the same game, it’s just a smaller version of what a brand like Pepsi can do. All in all, I have a tremendous amount of respect for these two — being the inside of this industry, I know how much work it really takes and I admire them so much for it.